The Cricket World Cup is the premier international championship of men's One Day International (ODI) cricket. The event is organised by the sport's governing body, the International Cricket Council (ICC), with preliminary qualification rounds leading up to a finals tournament which is held every four years. The tournament is the world's third largest and most viewed sporting event. According to the ICC, it is the most important tournament and the pinnacle of achievement in the sport. The first Cricket World Cup contest was organised in England in 1975. A separate Women's Cricket World Cup has been held every four years since 1973. The finals of the Cricket World Cup are contested by all ten Test-playing and ODI-playing nations, together with other nations that qualify through the World Cup Qualifier. Australia has been the most successful of the five teams to have won the tournament, taking four titles. The West Indies have won twice, while India, Pakistan, and Sri Lanka have each won once. The 2007 Cricket World Cup matches were held between 13 March and 28 April 2007, in the West Indies . The 2007 tournament had sixteen teams competing in a pool stage (played in round-robin format), then a "super 8" stage, followed by semi-finals and a final. Australia defeated Sri Lanka in the final to retain the championship. The first ever international cricket match was played between Canada and the United States, on the 24th and 25th of September 1844. However, the first credited Test match was played in 1877 between Australia and England, and the two teams competed regularly for The Ashes in subsequent years. South Africa was admitted to Test status in 1889. Representative cricket teams were selected to tour each other, resulting in bilateral competition. Cricket was also included as an Olympic sport at the 1900 Paris Games, where Great Britain defeated France to win the gold medal. This was the only appearance of cricket at the Summer Olympics. The first multilateral competition at international level was the 1912 Triangular Tournament, a Test cricket tournament played in England between all three Test-playing nations at the time: England, Australia and South Africa. The event was not a success: the summer was exceptionally wet, making play difficult on damp uncovered pitches, and attendances were poor, attributed to a "surfeit of cricket". In subsequent years, international Test cricket has been generally been organised as bilateral series: a multilateral Test tournament was not organised again until the quadrangular Asian Test Championship in 1999. The number of nations playing Test cricket increased gradually over the years, with the addition of West Indies in 1928, New Zealand in 1930, India in 1932, and Pakistan in 1952, but international cricket continued to be played as bilateral Test matches over three, four or five days. In the early 1960s, English county cricket teams began playing a shortened version of cricket which only lasted for one day. Starting in 1962 with a four-team knockout competition known as the Midlands Knock-Out Cup, and continuing with the inaugural Gillette Cup in 1963, one-day cricket grew in popularity in England. A national Sunday League was formed in 1969. The first One-Day International event was played on the fifth day of a rain-aborted Test match between England and Australia at Melbourne in 1971, to fill the time available and as compensation for the frustrated crowd. It was a forty over match with eight balls per over. The inaugural Cricket World Cup was hosted in 1975 by England, the only nation able to put forward the resources to stage an event of such magnitude at that time. The first three events were held in England and officially known as the Prudential Cup after the sponsors Prudential plc. The matches consisted of 60 six-ball overs per team, played during the daytime in traditional form, with the players wearing cricket whites and using red cricket balls. Eight teams participated in the first tournament: Australia, England, the West Indies, New Zealand, India, and Pakistan (the six Test nations at the time), together with Sri Lanka and a composite team from East Africa. One notable omission was South Africa, who were banned from international cricket due to apartheid. The tournament was won by the West Indies, who defeated Australia by 17 runs in the final at Lord's . The 1979 World Cup saw the introduction of the ICC Trophy competition to select non-Test playing teams for the World Cup, with Sri Lanka and Canada qualifying. West Indies won a second consecutive World Cup tournament, defeating the hosts, England, by 92 runs in the final. At a meeting which followed the World Cup, the International Cricket Conference agreed to make the competition a quadrennial event. The 1983 event was hosted by England for a third consecutive time. By this time, Sri Lanka had become a Test-playing nation, and Zimbabwe qualified through the ICC Trophy. A fielding circle was introduced, away from the stumps. Four fieldsmen needed to be inside it at all times. India, an outsider quoted at 66-1 to win by bookmakers before the competition began, were crowned champions after upsetting the West Indies by 43 runs in the final. The 1987 tournament was held in India and Pakistan , the first time that the competition was held outside England. The games were reduced from 60 to 50 overs per innings, the current standard, because of the shorter daylight hours in the Indian subcontinent compared with England's summer. Australia won the championship by defeating England by 7 runs in the final, the closest margin in World Cup final history. The 1992 World Cup, held in Australia and New Zealand, introduced many changes to the game, such as coloured clothing, white balls, day/night matches, and an alteration to the fielding restrictions. The South African cricket team participated in the event for the first time, following the fall of the apartheid regime and the end of the international sports boycott. Pakistan overcame a dismal start to emerge as winners, defeating England by 22 runs in the final. The 1996 championship was held in the Indian subcontinent for a second time, with the inclusion of Sri Lanka as host for some of its group stage matches. In the semi-final, Sri Lanka, heading towards a crushing victory over India at Eden Gardens (Calcutta ) after their hosts lost eight wickets while scoring 120 runs in pursuit of 254, were awarded victory by default after riots broke out in protest against the Indian performance. Sri Lanka went on to win their maiden championship by defeating Australia by seven wickets in the final, which was held in Lahore . In 1999 the event was hosted by England, with some matches also being held in Scotland, Ireland, Wales and the Netherlands . Australia qualified for the semi-finals after reaching their target in their Super 6 match against South Africa off the final over of the match. They then proceeded to the final with a tied match in the semi-final (also against South Africa) where a mix-up between South African batsmen Lance Klusener and Allan Donald saw Donald drop his bat and stranded mid-pitch to be run out. In the final, Australia dismissed Pakistan for 132 and then reached the target in less than 20 overs, with eight wickets in hand. South Africa, Zimbabwe and Kenya hosted the 2003 World Cup. The number of teams participating in the event increased from twelve to fourteen. Kenya's victories over Sri Lanka and Zimbabwe, among others — and a forfeit by the New Zealand team, which refused to play in Kenya because of security concerns — enabled Kenya to reach the semi-finals, the best result by an associate. In the final, Australia made 359 runs for the loss of two wickets, the largest ever total in a final, defeating India by 125 runs. In 2007 the tournament was hosted by the West Indies ; the Cricket World Cup became the first such tournament to be hosted on all six populated continents. Bangladesh progressed to the second round for the first time, after defeating India, and they later went on to defeat South Africa in the second round. Ireland making their World Cup debut tied with Zimbabwe and defeated Pakistan to progress to the second round, where they went on to defeating Bangladesh to get promoted to the main ODI table. Following their defeat to Ireland, the Pakistani coach Bob Woolmer was found dead in his hotel room; it was later found out that he died of heart failure. Australia defeated Sri Lanka in the final by 53 runs (D/L), in farcical light conditions, extending their undefeated run in the World Cup to 29 matches and winning three straight World Cups. The Test-playing nations and ODI-playing nations qualify automatically for the World Cup finals, while the other teams have to qualify through a series of preliminary qualifying tournaments. Qualifying tournaments were introduced for the second World Cup, where two of the eight places in the finals were awarded to the leading teams in the ICC Trophy. The number of teams selected through the ICC Trophy has varied throughout the years; currently, six teams are selected for the Cricket World Cup. The World Cricket League (administered by the International Cricket Council) is the qualification system provided to allow the Associate and Affiliate members of the ICC more opportunities to qualify. In 2009, the name "ICC Trophy" will be changed to "ICC World Cup Qualifier". Under the current qualifying process, the World Cricket League, all 91 Associate and Affiliate members of the ICC are able to qualify for the World Cup. Associate and Affiliate members must play between two and five stages in the ICC World Cricket League to qualify for the World Cup finals, depending on the Division in which they start the qualifying process. Regional tournaments: Top teams from each regional tournaments will be promoted to a division depending on the teams' rankings according to the ICC and each division's empty spots. Division One: 6 Teams — All qualify for the World Cup Qualifier. Division Three: 8 Teams — Top 2 promoted to Division Two. Division Two: 6 Teams — Top 4 qualify for the World Cup Qualifier. Division Five: 8 Teams — Top 2 promoted to Division Four. Division Four: 5 Teams — Top 2 promoted to Division Three. Division Three (second edition): 6 Teams — Top 2 qualify for the World Cup Qualifier. World Cup Qualifier: 12 Teams — Top 6 are awarded ODI status and Top 4 qualify for the World Cup. The captains of the 2007 Cricket World Cup. The format of the Cricket World Cup has changed greatly over the course of its history. Each of the first four tournaments was played by eight teams, divided into two groups of four. There, competition comprised two stages, a group stage and a knock-out stage. The four teams in each group played each other in the round-robin group stage, with the top two teams in each group progressing to the semi-finals. The winners of the semi-finals played against each other in the final. With the return of South Africa in 1992 after the ending of the apartheid boycott, nine teams played each other once in the group phase, and the top four teams progressed to the semi-finals. The tournament was further expanded in 1996, with two groups of six teams. The top four teams from each group progressed to quarter-finals and semi-finals. A new format was used for the 1999 and 2003 World Cups. The teams were split into two pools, with the top three teams in each pool advancing to the Super 6. The "Super 6" teams played the three other teams that advanced from the other group. As they advanced, the teams carried their points forward from previous matches against other teams advancing alongside them, giving them an incentive to perform well in the group stages. The top four teams from the "Super 6" stage progressed to the semi-finals, with winners playing in the final. The last format used in the 2007 World Cup, features 16 teams allocated into four groups of four. Within each group, the teams play each other in a round-robin format. Teams earn points for wins and half-points for ties. The top two teams from each group move forward to the Super 8 round. The "Super 8" teams play the other six teams that progressed from the different groups. Teams earned points in the same way as the group stage, but carrying their points forward from previous matches against the other teams who qualified from the same group to the "Super 8" stage. The top four teams from the "Super 8" round advance to the semi-finals, and the winners of the semi-finals play in the final. The current format, approved by ICC to be used in 2011 World Cup, features 14 teams allocated. Within each group, the teams will play in a round-robin format. The top four teams from each group will proceed to the knock out stage playing quarter-finals. Winners of the quarter-finals will play semi-finals and the winning semi-finalists will play in the final. The Cricket World Cup trophy which is kept by the ICC. The ICC Cricket World Cup Trophy is presented to the winners of the World Cup finals. The current trophy was created for the 1999 championships, and was the first permanent prize in the tournament's history; prior to this, different trophies were made for each World Cup. The trophy was designed and produced in London by a team of craftsmen from Garrard & Co over a period of two months. The current trophy is made from silver and gild, and features a golden globe held up by three silver columns. The columns, shaped as stumps and bails, represent the three fundamental aspects of cricket: batting, bowling and fielding, while the globe characterises a cricket ball. The trophy is designed with platonic dimensions, so that it can be easily recognised from any angle. It stands 60 cm high and weighs approximately 11 kilograms. The names of the previous winners are engraved on the base of the trophy, with space for a total of twenty inscriptions. The original trophy is kept by the ICC. A replica, which differs only in the inscriptions, is permanently awarded to the winning team. The tournament is the world's third largest and most viewed sporting events, being televised in over 200 countries to over 2.2 billion television viewers. Television rights, mainly for the 2011 and 2015 World Cup, were sold for over US$1.1 billion, and sponsorship rights were sold for a further US$500 million. 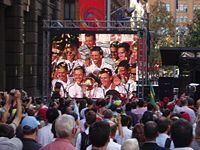 The 2003 Cricket World Cup matches were attended by 626,845 people, while the 2007 Cricket World Cup sold more than 672,000 tickets and recorded the highest ticketing revenue for a Cricket World Cup. Successive World Cup tournaments have generated increasing media attention as One-Day International cricket has become more established. The 2003 World Cup in South Africa was the first to sport a mascot, Dazzler the zebra. An orange raccoon-like creature known as Mello was the mascot for the 2007 Cricket World Cup. Civic Centre, South Africa honours the 2003 World Cup. The International Cricket Council's executive committee votes for the hosts of the tournament after examining the bids made by the nations keen to hold a Cricket World Cup. England hosted the first three competitions. The ICC decided that England should host the first tournament because it was ready to devote the resources required to organising the inaugural event. India volunteered to host the third Cricket World Cup, but most ICC members believed England to be a more suitable venue because the longer period of daylight in England in June meant that a match could be completed in one day. The 1987 Cricket World Cup was the first hosted outside England, held in India and Pakistan . Many of the tournaments have been jointly hosted by nations from the same geographical region, such as South Asia in 1987 and 1996, Australasia in 1992, Southern Africa in 2003 and West Indies in 2007. India, Sri Lanka, and Bangladesh are going to host the 2011 World Cup. Pakistan was the 4th country involved to host the 2011 World Cup; however, due to security reasons after the March 3, 2009 Lahore terror attacks on the Sri Lankan cricket team bus, the 14 scheduled matches in Pakistan (including one semi-final) have been reassigned to the remaining 3 countries by the ICC executive board. The final for the 2011 world cup will be in Mumbai. Every Test-playing nation now has hosted or co-hosted a Cricket World Cup at least once, except Bangladesh , the most recent country to achieve Test status. Nineteen nations have qualified for the finals of the Cricket World Cup at least once (excluding qualification tournaments). Seven teams have competed in every finals tournament, five of which have won the title. The West Indies won the first two tournaments, and Australia has won four, while India, Pakistan and Sri Lanka have each won once. The West Indies (1975 and 1979) and Australia (1999, 2003 and 2007) are the only nations to have won consecutive titles. Australia has played in 6 of the 9 final matches (1975, 1987, 1996, 1999, 2003, 2007) including the finals in the four most recent tournaments. England has yet to win the World Cup, but has been runners-up three times (1979, 1987, 1992). The best result by a non-Test playing nation is the semi-final appearance by Kenya in the 2003 tournament; while the best result by a non-Test playing team on their debut is the Super 8 (second round) by Ireland in 2007. Sri Lanka, who co-hosted the 1996 Cricket World Cup, is the only host to win the tournament, though the final was held in Pakistan. England is the only other host to have made the final, in 1979. Other countries which have achieved or equaled their best World Cup results while co-hosting the tournament are New Zealand, semi-finalists in 1992; Zimbabwe, reaching the Super Six in 2003; and Kenya, semi-finalists in 2003. In 1987, co-hosts India and Pakistan both reached the semi-finals, but were eliminated by Australia and England respectively. The table below provides an overview of the performances of teams over past World Cups. 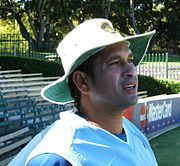 Sachin Tendulkar, the leading run-scorer in World Cup history.